This product takes green superfoods to a whole new level. Every single ingredient in this potent mixture is 100% raw and organic. The taste is mild and neutral and can be easily added into your morning routine. Try adding this to smoothies or simply shake in water or coconut water. We like that this product is packed with a high quality probiotic formulation which supports the GI tract and with a full digestive enzyme complex it is very easy for the body to absorb. By supplementing with a product like this one it can greatly increase your energy and is a powerful yet gentle way to slowly detox the body. This green superfood is created with low-temperature food drying technology which result in even more preservation of the nutrients. 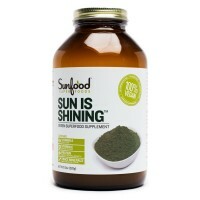 Ingredients include whole leaf barley grass, whole leaf wheat grass, nettle leaf, horsetail, alfalfa leaf juice, dandelion leaf juice, kamut grass juice, barley grass juice, oat grass juice, broccoli juice, kale juice, spinach juice, parsley juice, burdock root, nopal cactus, ginger, amla berry.